Welcome to the Fish and Wildlife Blog! During the coming academic year, I will be putting up some of the weekly highlights from the four core courses of SLUs Masters Programme in the Management of Fish and Wildlife Populations! The second year consists of a range of selective courses (<– Check it out!) that you can take part of to tailor your time at SLU to pursue your interests and suit your future needs! It’s also possible to, following American tradition, conduct a masters thesis running over a full academic year, or, like me, conduct two separate masters thesis in order to fulfill several programme requirements. I’ve prior to applying to Fish and Wildlife taken a BSc. in Forestry here at SLUs Jägmästarprogramme (BSc. + MSc. Forestry), and quite recommend the lovely atmosphere here in Umeå. Rather uniquely (I’ve never heard of anything like it! 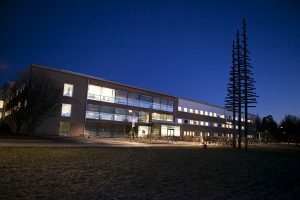 ), Umeå campus hosts two universities (The Swedish University for Agricultural Sciences & Umeå University) right next to eachother. As such, Umeå is a vibrant, active city with lots of events for both international and domestic students (you’ll have no problems at all speaking in english to anyone you might meet)! It’s a city just the right size to provide all the amenities you’d want, but still stay small enough to stay cozy and easy to get to know. In particular, Umeå will treat those of you who love the great outdoors well, as it is renowned for its close proximity to nature: going hiking, cycling, skiing, climbing or just about any sport you might think of, is a breeze! The Forestry Students Union provides all SLU students in Umeå with a students card, which is necessary to visit more or less all student events and parties organized by the different student unions, so don’t miss out; it also serves to get you those great students discounts!